Probably the most widely known US industrial designer. Born in Paris, and as a 15-year old boy, designed a rubber-band powered model airplane, the Ayrel, patented it, and formed a company to produce quantities in rented space. He studied engineering 1910-1914. He served in French army in WWI and arrived in US in 1919. Worked as fashion illustrator for Vogue and Harper's Bazaar, and designed costumes for Florenz Ziegfeld. Opening his own office in 1929, his first product assignment was a duplicating (mimeograph) machine for Gestetner, which was introduced in 1933 and featured in a 1934 Fortune magazine article about the new profession of industrial design. In 1930 he patented his first automobile design, and soon designed the 1932 "cycle-fender" Hupmobile and the more radical 1934 model. 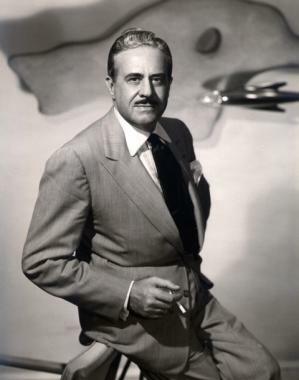 At the Worlds Fair in 1939, he designed The House of Jewels interiors. Major clients included Greyhound (1946 Silversides bus, 1948 Scenicruiser); Pennsylvania Railroad (1934 GG-1 locomotive, the 1936 K4S, and the 1938 S-1 and T-1), Sears (1935 Coldspot Super Six refrigerator); Coca-Cola (1940 and 1947 dispensers); American Tobacco Company (1942 Lucky Strike package); International Harvester (1942 Caterpillar tractor); Studebaker (1939 Champion, dramatic 1947 postwar models, 1950 models, the elegant 1953 Starliner model, and the 1962 Avanti); and Frigidaire (1955 line of major appliances). In 1944 he was one of the 15 practitioner founders of the Society of Industrial Designers. He was on the cover of Time magazine in 1949, when his yearly gross sales exceeded $3 million and the yearly sales of his products was $1 billion. He established his Paris office in 1952. He wrote a number of books, including, The Locomotive (its Esthetics), 1937, Never Leave Well Enough Alone (1951), and Industrial Design (1979). By 1960 his office, Raymond Loewy Associates (RLA), had a staff of 180, and created some of America's best known icons, including the Exxon logo (1966), US Post Office logo (1970), Air Force One interiors and external graphics (1973), NASA Skylab 2 space station (1973) and the Concorde interiors (1976). His US office filed for bankruptcy in 1977, closing US offices but keeping open those in Europe. Sometimes you just wish you knew what it must have been like back in the heyday of Industrial Design. Watch this interview with Budd Steinhilber, FIDSA who apprenticed with the Loewy office and tells us what it was like!